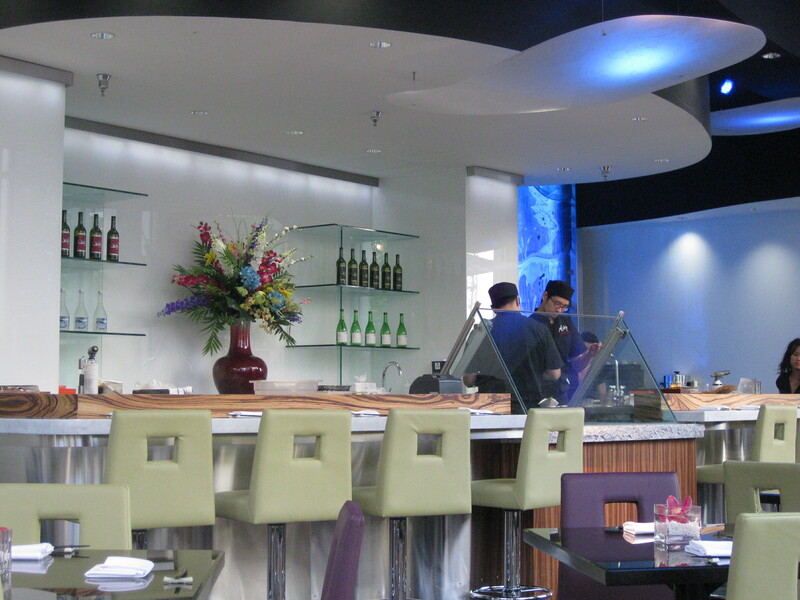 Joseph Mallozzi's Weblog: June 2, 2009: Oishi Sushi! Yancha na Doggies! Omoshiroi Mailbag! 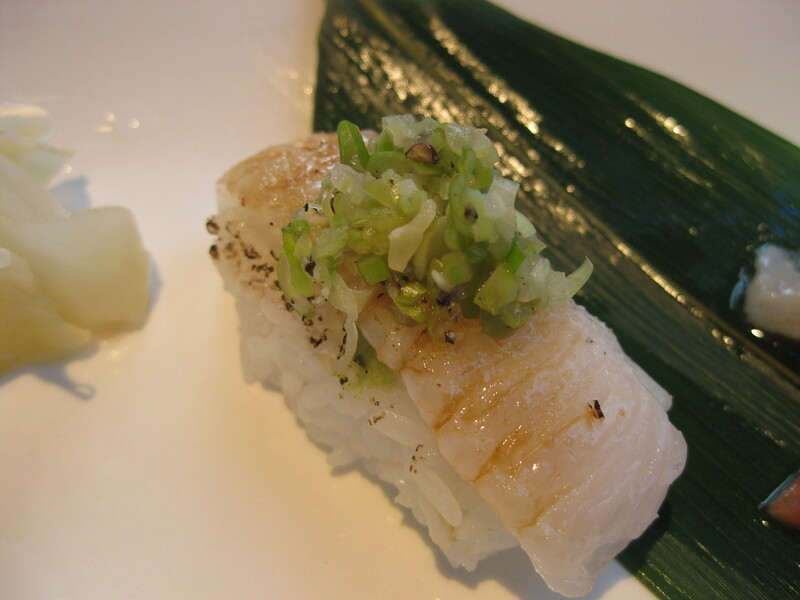 June 2, 2009: Oishi Sushi! Yancha na Doggies! Omoshiroi Mailbag! Hey, when’s the last time I checked out a new restaurant? Trick question. I checked one out last night. But, really, how were you to know? We went to Miku, a fairly new Japanese restaurant on the Vancouver scene that specializes in Aburi-style sushi (“lightly seared and infused with savory French sauces”), sourcing local produce and ingredients for its artfully presented dishes. 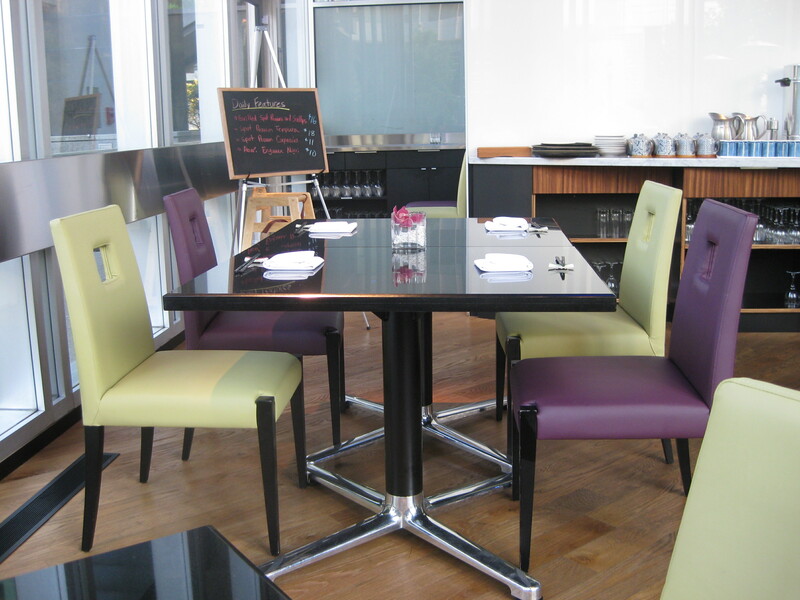 The room is colorful and contemporary, its open dining area surrounded by glass walls looking out onto an expansive patio. We sat indoors and ordered six items from the menu. 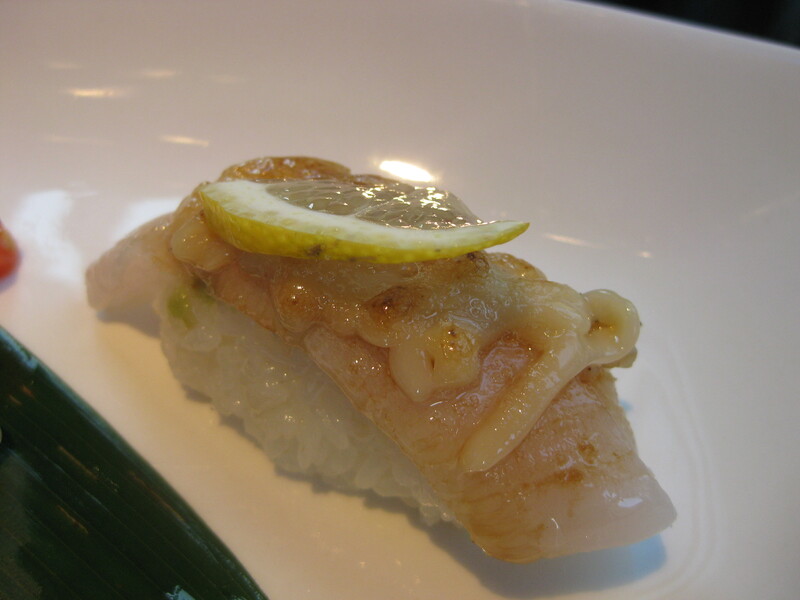 The first was one of the daily features, engawa nigiri, “engawa” being a choice muscle in a hirame’s (flounder‘s) dorsal fin. It was served three different ways – with a touch of salt and pepper, a spicy salsa, and the house Miku sauce – each one utterly delicate and delicious. Our next dish was the Soba Peperoncino, Soba Noodle tossed in Olive Oil, Jalapeno, Squid and Bell Peppers. As she took our order, our waitress inquired whether we’d like it spicy or not. We, of course, requested the spicy version, but the Soba Peperoncino we were served lacked any real bite. Next up was the King Roll – Prawn Tempura, Crab Meat, Avocado, Golden Caviar with Spicy Mayo Sauce. While tasty, it was a little unwieldy and struck me as more a menu item worthy of a less refined sushi eatery. 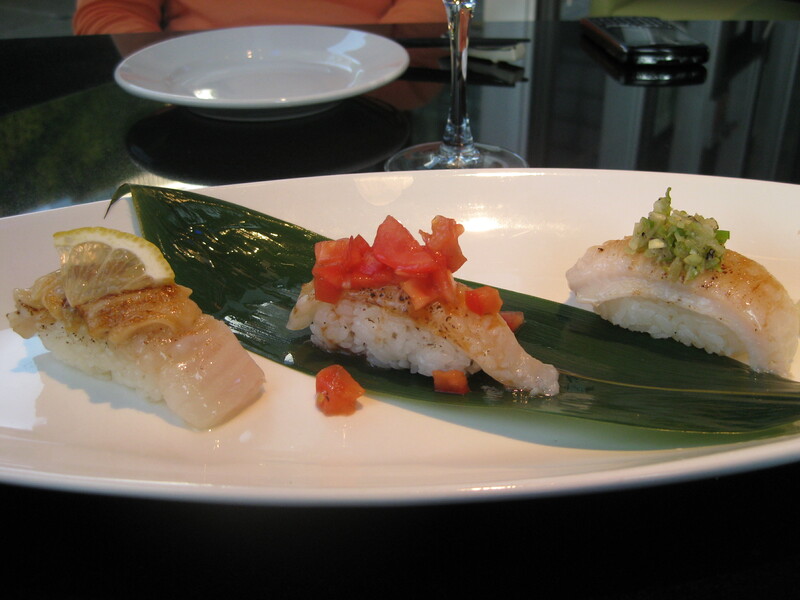 The next two dishes came together, two rolls – The Scallop Crunchy Roll (Chopped Scallop, Golden Caviar, Tempura Bits) and The Aburi Saba Oshi Sushi (Pressed Aburi Mackerel with Miso Sauce) – and proved out of this world. When I go back (and I will be back) I’ll be doing a double order of both. Rounding out our mains was the Washugyu Carpaccio (American Kobe Beef with Avocado Sauce). The beef was very delicate – so delicate, in fact, that it was thoroughly overwhelmed by the accompanying sauce. Also, Fondy felt the meat could have benefited from a thinner slicing. Now dessert rarely warrants a look at most Japanese restaurants but, Miku is different. It takes its sweets seriously. How seriously? Well, it apparently employs three different pastry chefs, one of whom hails from Kyoto. Impressive? You bet. Fondy had the Yuzu Tart, a “Yuzu” Japanese Citron Cream Tart served with Vanilla Ice Cream. Although she found it a tad sweet, I had no problem polishing it off for her – and given my aversion to any trace of tartness in my desserts, that’s a huge compliment. 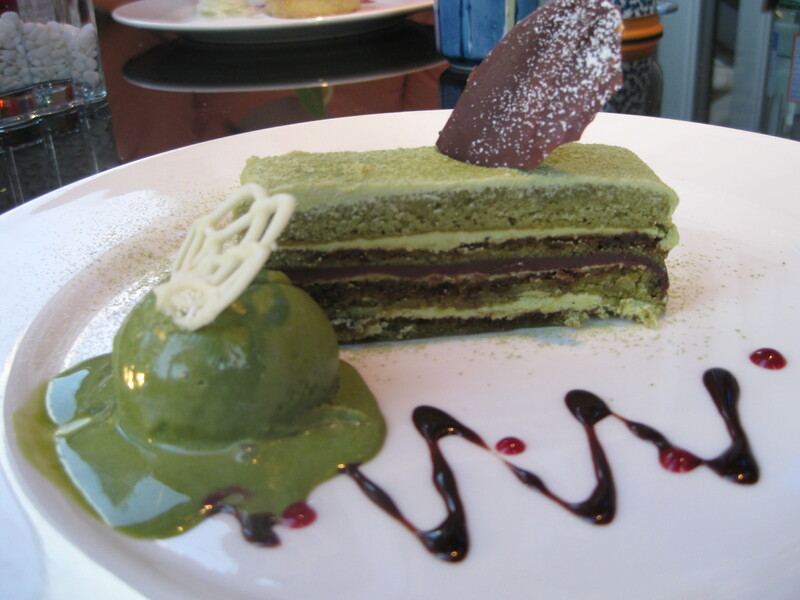 As for my dessert – well, just the other week, I had a Green Tea Opera Cake at Market. While good it, alas, in no way compared to The Greatest Cake I’ve Ever Had The Pleasure To Eat = The Green Tea Opera Cake at Sadaharu Aoki’s in Tokyo’s Roppogni Hills District. It turns out Mizu does their own version – Gateau and Almond Sponge Cake layered with Green Tea Cream and Ganache – served with an astoundingly dense and rich green tea ice cream. The verdit? Divine. Not as good as the Sadaharu Aoki version mind you, but remarkable nevertheless. Well, the month of May has come to an end and, thankfully, my dogs’ twitter account (http://twitter.com/JellMaxBubLu) did not achieve its targeted 1000 followers, thus sparing us all a spoiler pic of the first page of the Stargate: Extinction script (my contact on the inside tells me that was their diabolical plan). Unfortunately, they have managed to sneak out a few little spoilers buried within the texts of their existing twitters (http://twitter.com/JellMaxBubLu) but, thankfully, they’ve gone unnoticed. Still, the fight to deny my dogs their 1000 followers continues (here: http://twitter.com/JellMaxBubLu). Please, do your part to avoid the risk of further Stargate Atlantis movie and Stargate Universe spoilers getting out by NOT sign up to follow my dogs on twitter (http://twitter.com/JellMaxBubLu)! Oh, yeah – my bad in a recent post when I was trying to wrack my brain to figure out what story I’d failed to list in the back half. In fact, I forgot that Space was pushed to #11 – so they all move down a slot. And speaking of slots, great news on the director front. Both Peter DeLuise and Alex Chapple will be returning to direct episodes in the back half. Today’s blog entry is dedicated to birthday individual unegawaya. PG15 writes: “1. Did the same freelancer write Faith and #14, or were they written by different people? 2. Will you be able to tell us the Freelancer’s names eventually? 3. Any ideas on when more promotional stuff is coming out? Besides this blog, things have been pretty quiet on the SGU front. Answers: 1. Nope. Different freelancers. 3. No idea what MGM and SciFi are planning on their end. My guess is this year’s San Diego Comic Con will be the big roll-out (late July). 4. There will be plenty of action for those of you into that sort of thing. The episode presently in prep for instance, Space, is going to be spectacular. The Visual Effects meeting started at 2:00 p.m. this afternoon and they were still in there when I left. Answer: Baal’s wardrobe. And probably one of those nifty Icarus uniforms. DasNdanger writes: “1. How are you liking Y – The Last Man and Scalped?? Answers: 1. Liking Y: The Last Man, loving Scalped. 2. Yep, there was a list and it did, indeed, disappear. I had to go back into my widget controls to make it magically reappear. Thanks for the heads up. Answer: The shooting style will be a little looser, allow the director more freedom to move the camera rather than have to rely on static shots. This doesn’t mean it’s going to be shot in a nausea-inducing handheld documentary style. Rather, it will be more visually dynamic than its predecessors. Before the season began, Brad and Robert sat down and talked to Andy Mikita about what they envisioned for the show – and Andy delivered big time in the opening three-parter. Ensuing directors took their cues from Brad, Rob, Andy, and the look of those three episodes. Kathi writes: “1. Can you please explain the relationship between Teyla and John? Are they “Almost lovers”, or like brother and sister or is there only a team- relation? Answers: 1. There is certainly a mutual attraction there but, alas, Teyla has settled down with Kanaan. Answer: Sorry. I’m out of the loop on the game. Answer: It’s not that much work – just that my right sidebar is pretty busy as it is. 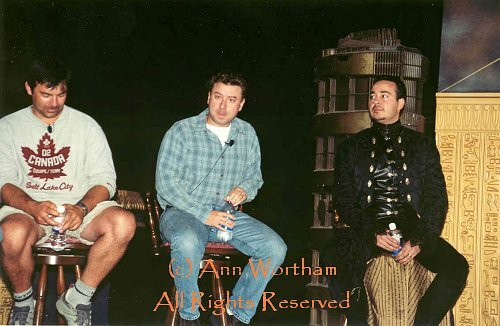 Answer: I was big into Clive Barker. I very much enjoyed King as well. Answer: Agreed. As I said, The Unblemished had strong echoes of Barker. Regarding the “London in minute detail” comment – do you live/have you ever lived in London? Did your familiarity with the city make the horror all the more effective? Answer: I thought Williams struck a fine balance. That said, I thought the same thing of a previous book only to have someone comment that they found there wasn’t enough description and detail. To each his own I suppose. Answer: Final conference call with the President of the company on Thursday in which we’ll pitch out our vision for the series: talking dogs and invisible monkeys. Answer: Extra points for the title! Major D. Davis writes: “1. Besides Air, Earth and Life, will there be any episodes partially set on earth( you know, getting out of those sound stages for a breath of fresh air)? 2. Again, I’m not sure what the studio or network have planned. Answer: Well, anyone who has frequented this blog for any amount of time knows that isn’t true. Over the past few months, I’ve expressed my excitement about the upcoming Stargate: Universe series and, more often than not, my comments have centered on our wonderful cast. From Robert Carlyle to our local supporting players, they are all very talented, professional, and genuinely kind individuals. As I told Michael Shanks and wife Lexa Doig the last time they dropped by the office: It’s an embarrassment of riches for us this year. And, speaking of actors from our former shows, feel free to search this blog for what I’ve had to say about actors like Michael Shanks, Lexa Doig, Richard Dean Anderson, Amanda Tapping, Christopher Judge, Don S. Davis, Beau Bridges, Ben Browder, Claudia Black, Robert Picardo, Jewel Staite, Rachel Luttrell, David Hewlett, Jason Momoa, and David Nykl – to name just a few – and it will be readily apparent that we have great respect for the contribution cast members past and present have made to the franchise. Of course, it’ll be up to you, the fans, to form your opinion on this new cast. But take it from someone who has been working with them since February – every one of them is not only great at what they do, but incredibly down to earth. Not an inflated ego or demanding grandstander in the bunch. Answer: I think it’s a terrible idea that will lead to traffic chaos. City Hall’s thinking is that the move will be good for the environment because it will encourage people to bike into town. Of course the reality is that this bonehead move will actually hurt the environment because of all the backed-up cars idling on the bridge. Next Article June 3, 2009: Scrappy Dogs. Okay, I Think I Got It Right This Time. Well Done, Mr. Goldsmith. Cookie Monster’s Good Turn. The Donutella. And WTF is ha ha hee hee ha ha ho? Joe, Regard costumes – Great choice of Baal’s wardrobe. A few years ago at Gatecon, you wore one and looked just super. Your appearance in the black costume was just grand. So Todd is freed in the movie! Yehaaa you can’t keep a good human eating wraith dwn. Left your subtle-pants in the closet today, eh? Thanks for the pics of all the delectable Japanese-French fusion food. I’m glad the new restaurant did a pretty good job overall, and that you and Fondy had the chance to size up some new taste treats. That’s better, of course, than being a new taste treat. – Which leads me to The Drowned Life, which I’ve almost finished and have enjoyed very much overall. I felt the title story was somewhat predictable, but that has been more than compensated for by the other stories. Ford’s otherworldly fantasies are jaw-dropping in the wonderment they produce. The best author comparison that comes to mind (given my limited exposure) is Gene Wolfe, but whereas Wolfe’s narratives left me perplexed and frustrated, Ford’s style is often beyond delightful and the unique developments can be well-grasped with a bit of thought. Best part: So many of his stories just get better with a second reading. Thanks again for keeping us current with so much new speculative fiction. Food didn’t really appeal to me this time. Glad to hear about the directors. Thanks for answering my questions. ( I promise not to ask any more questions regarding spoilers about sgu). Is your dogs atlantis hint contained in their twitter on May 30th? Joe, I am a bit saddened here today. I think some people get a kind of perverted thrill by stirring up trouble between others. Somehow it enriches their small lives. And you have such a wonderfuly snarky personality that it must be that much more entertaining to them when you volley back. I honestly feel a bit soiled. Are you sure you want to feed this modern day blog induced spectacle any further? In other days and times disagreements between people were between actual people, not fed through and processed by some pubic third or fourth hand rumor mill. I hear ya, but I think it’s fair for Joe M. to defend the SGU cast against a presumption that TPTB think actors are dispensable. The casting process for SGU took way, way longer than for SGA (partly because the green light came earlier and they had more time, I know). That and everything we’ve heard shows how much emphasis the franchise is placing on casting, esp for a character-driven show like SGU. So if SGU is successful, it means they got a lot of things right, including the actors. I don’t see how a successful SGU is a slam to the SGA actors, unless Joe F is implying there were some lessons learned on SGA. Oh, have you been following the tech conference this week? E3? Some of the stuff coming out sounds/looks very cool. Project Natal (Microsoft) especially. You know technology is getting up there in the cool-factor when it seems like it would be more at home in science fiction! Oh, forgot to ask: with that review does it mean you’d recommend Miku? How does it rank with, say, Tojo’s? Or is it too different? Is Todd still in the city someplace at the end of 5×20? Or was he left off someplace in Pegasus before Atlantis left to defend Earth? Firstly, can I say how refreshing it is to hear an Actor express his or her opinions, without necessarily feeling bound by the spin of a studio or franchise. As with the premature cancellation of any successful show, Fans will always feel they have been dealt an unfair blow. It’s only natural and understandable. Of course, for the most part, they have no physical connection to the production itself and thus any rumours or tides of opinion, can only be based on frustration aimed at those involved in the decision making. Agreed that, as a Writer and fairly substantial cog within the Stargate machinary, you will have a more informed view of what is happening. Blog Readers here will no doubt be grateful that you lay their concerns to rest. That said, fielding frustration from an uninformed Fan without access to the daily studio life, is one thing. But when an Actor expresses similar sentiments, don’t you feel that perhaps something has gone awry somewhere along the way? As a long time Reader of this Blog, i’d also like to hark on an issue that has been biting away for some time now. Perhaps the finishing tone of today’s entry has brought it (sadly so) to the forefront: You are often quoted as saying that there is ..little point talking about something, if you’ve nothing nice to say on the subject. Should we then perhaps take something from the fact that you rarely speak of Mr Flanigan, even when (often) praising the tremendous qualities of his Co-Workers? Ha! I knew I didn’t imagine that picture of you in that Ba’al outfit; as I recall, it had lace cuffs or something. I spent almost 5 minutes searching the ‘nets, but couldn’t find it. Luckily, sylvia‘s mention of it being during Gatecon helped. And here they are! Two of them! Alas, neither were the ones I remembered finding and laughing…with. Not at, with. Oh yes. Anyways, thank you AGAIN for answering my questions! Man, I’m on a roll. Hmm…better make my next one count. One hand claps and nobody’s around. Does it make a sound? And regarding the blogroll, Joe, do you think having a link to your own blog in your blogroll will increase repeat traffic? @ Shanise – so, babe, will you follow the recomendation, when you got your answer? arigatou gozaimasu for the totemo omoshiroi entry. Are the SGU cast members getting the fanmail already? (you’ve mentioned before that one of them already got something.. I think it was nice show of support). Lou Diamond Phillips?? LOU DIAMOND PHILLIPS?? As in “I’m a celebrity, get me out of here” trash TV??? Sanjaya I can see, the wife of a disgraced Chicago politician I can see, but a lead actor for a brand new Stargate series starring in a TV show full of losers and wannabe’s, on a network that celebrates how closely it has mirrored the TV station in the movie Network? I can just see it now; NBC graces its scfi channel’s SGU with some pro bono 30-sec spots on the run up to the premiere and many thousands of potential viewers and fans sees Phillips in one of the clips and thinks “This guy? Didn’t I just see him eat a spider in a reality show of D List celebrities?” Suddenly the respectability of the show takes a dive. Does anyone think they would ever see anyone from SG1 or SGA on one of these shows? And this one, this show is the worst of the worst. Were you guys aware of this horrendously stupid career choice for Phillips? Belated comments on Unblemished. Got to say, I considered this one a home run. From the opening, through the slow unfolding of the causes and results of that horrific event, the author kept my interest gripped to the tale. For me, the strongest aspect of the tale was the prose. As already pointed out, this book is not for the weak minded. Yet I appreciated that Mr. Williams also left certain details to the readers’ minds, while making it clear what was happening. This gave my sometimes-too- vivid imagination full rein to paint pictures that made the book live up to its horror genre. I’ll simply second the opinions of many about the characters. While not so cardboardish(if I say that’s a word then it is) as some of the other horror tales I’e read, I did find it hard to engage emtionially with any of them. My only other negative comment would be in the shifting perspectives. While I’ve read and enjoyed other books that move from one character to another and back in order to lay out the story, for some reason I didn’t feel that the technique worked as well here. I don’t see how it could have been managed, but I thinkn this would have slightly more enjoyable seen through a single character’s POV. Again, only a minor quibble. But overall, really enjoyed this particular BotM club entry. Anyways, thanks as always for the pictures and updates. Think I’ll pass on trying out Miku. I’m ok with the occasional sushi, but I’d still be trying to decide what to eat by closing time with such a selection. Wow, what great food!! I have only one question to ask….Did they sing the Tippu Tippu song? Thanks for updates re: Bubba et al’s twitter page. Yes, I did notice the odd word here and there…but I think I let PG15 and others decode it for me…. It’s not that the dogs’ Tweets are going unnoticed….I just can’t figure out how to respond on that darn thing. do you live/have you ever lived in London? Did your familiarity with the city make the horror all the more effective? No, I’ve never even been to London. But Williams presented the city in such a familiar (to him) way that it gave a very “real” feel. Like say, watching a documentary (like 28 Days Later!) that would open a scene with a caption of where the scene takes place. dasNdanger, freek is correctly spelled freak so I’m assuming it’s suppose to be free, since Joe knows how to spell.